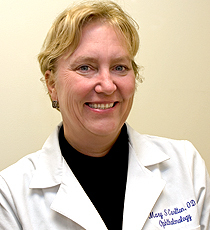 Mary S. Carlton, OD, is an assistant professor of ophthalmology in the Section of Comprehensive Ophthalmology, Vision and Optical Services, at Emory Eye Center. Her concentration is in primary eye care and the fitting of contact lenses in both adults and children. Her research interests include contact lens materials and products. She is a board certified optometrist. Prior to her work at Emory Eye Center, Dr. Carlton worked as a staff optometrist for the University of Wisconsin in Madison; as director of vision services for the University of Utah in Salt Lake City; as a lieutenant in the United States Navy, stationed at Oakland Naval Hospital in Oakland, California; and in private practice in East Point, Georgia. Dr. Carlton is chairman of the American Board of Optometry Item Reviewers Committee and a member of the Examination Development Committee. She is a member of the American Optometric and the Georgia Optometric associations. She volunteers regularly at The Good Samaritan Health Center in Atlanta, Georgia.